The Syrian Air Force, officially the Syrian Arab Air Force (Arabic: القوات الجوية العربية السورية‎, Al Quwwat al-Jawwiyah al Arabiya as-Souriya), is the air force branch of the Syrian Armed Forces. It is variously abbreviated in English to SAF, SAAF, or SyAAF. It was established in 1948. Land-based air defense systems are grouped under the Syrian Air Defense Force, which split from both the Air Force and the Army. Roundel 1963-1972 (left) and fin flash 1963-1972 (right). The end of World War II led to a withdrawal of the United Kingdom and France from the Middle East, and this included a withdrawal from Syria. 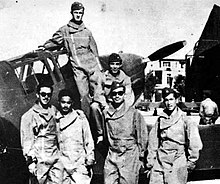 In 1948, the Syrian Air Force was officially established after the first class of pilots graduated from a French-run flight school at Estabel airfield in Lebanon, and with help of aircraft left behind by the French. Further training of early Syrian military fliers was continued with help of a sizeable group of Croat and German instructors, contracted by the Lebanese and Syrian governments from refugee camps in Italy. Between foreign instructors were Mato Dukovac (leading Croatian 'ace' of the World War II) and Fritz Strehle (former Me.262 pilot with 2./JG 7 of the Luftwaffe), who trained Syrian pilots at Estabel in 1948, and at Nayrab airfield (south of Aleppo) in 1949. Organized into two 'squadrons', one of which was equipped with North American T-6 Harvards, the air force participated in the 1948 Arab–Israeli War, conducting bombing raids against Israeli forces and settlements. One T-6 was lost to ground fire while attacking Ayelet Hashahar on 16 July, and another possibly shot down by Morris Mann (flying an Avia S-199) on 10 June. 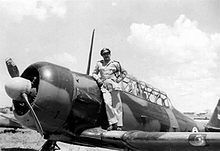 The Syrian Air Force claimed its sole kill of the war on 10 July when a rear gunner of a Harvard shot down an Avia S-199 flown by Lionel Bloch. During and immediately after this war, successive governments sought to bolster the air force through the acquisition of Fiat G.55s, Fiat G.59B-2s, and Fiat G.46-1s from Italy. In January 1950, a set of contracts was signed with London, providing for training of Syrian officers and pilots, along with the acquisition of Chipmunk basic trainers, Supermarine Spitfire Mk 22s, and Meteor F.Mk 8 and T.Mk 7 jets from Great Britain. While the Chipmunks and Spitfires arrived without problems and entered service with the Flight School at Nayrab, the delivery of Meteors was held up by a temporary British arms embargo. Original batch of Meteors manufactured for Syria was sold to France instead. It was only following additional negotiations that SAF received its first jet aircraft, in form of two Meteor F.Mk 8s. All 12 were in Syria by 9 March 1953. Another batch of seven refurbished ex-RAF F.Mk 8s and two FR.Mk 9 reconnaissance fighters followed in 1956. Meanwhile, in summer 1954, six ex-RF Meteor NF.Mk 13 were delivered without their radar equipment: in Syria, they were used for training purposes until 1958. Because the government of Great Britain imposed additional arms embargoes, most of pilots for Meteors had to be trained in Egypt. In 1955, Syria placed its first order for 24 MiG-15bis fighters and 4 MiG-15UTI two-seat conversion trainers from Czechoslovakia ('Operation 104'). Another batch of 24 MiG-15s was ordered in early 1956. All these aircraft were delivered to Egypt, by October 1956, but their pilots and ground crews were still undergoing training when Israel, followed by France and Great Britain, invaded Egypt in the course of the Suez Crisis of 1956. Three MiG-15UTIs were evacuated to Syria via Saudi Arabia and Jordan; 20 MiG-15bis and 1 MiG-15UTI were destroyed in British attacks on Abu Suweir Air Base. The second batch of 20 MiG-15bis' was not yet assembled: the aircraft in question were all damaged by British air strikes, but subsequently repaired and donated to Egypt. On 6 November 1956, Meteors from No. 9 Squadron Syrian Air Force have shot down a Royal Air Force Canberra PR.7 that was involved in reconnaissance of Syria and Iraq. The aircraft crashed on the border to Lebanon: one crewmember was killed, while two were captured alive. Sixty MiG-17s - including 20 radar-equipped MiG-17PFs - were ordered at the end of 1956 and Syrian pilots were dispatched to the USSR and Poland for training. The first aircraft arrived in January 1957 and by the end of the year, two MiG-17 squadrons were defending the capital from their base at Damasucus' Mezzeh Military Airport. By the end of the year, additional orders were placed in the USSR for 12 Ilyushin Il-28 bombers. In February 1958 Syria and Egypt joined to create the United Arab Republic. The Syrian Air Force was integrated into the United Arab Republic Air Force (UARAF) and ceased to exist. Nearly all of its aircraft and personnel, all of training aids and most of the equipment were re-deployed to Egypt, and replaced by two squadrons of MiG-17Fs of the UARAF. For example, recently delivered MiG-17PFs and their pilots formed the No. 31 'Crow-Bat' Squadron of the UARAF. During the times of the United Arab Republic, this unit was always commanded by a Syrian officer. The union ended following 1961 Syrian coup d'état. The new military flying service - officially designated the Syrian Arab Air Force (SyAAF) - was re-established later the same year, using aircraft left behind by the Egyptians, including about 40 MiG-17Fs and 4 Il-28s. The new government Syrian Arab Republic attempted to buy additional aircraft in Germany and Italy, in 1961 and 1962. When all related efforts failed, Syria was left without a choice but to turn to Czechoslovakia for arms. By the time, Czechoslovakia was out of the business of producing fighters and interceptors, and thus the Syrians had to buy from Soviet Union instead. On 19 June 1962, Damascus and Moscow signed a major contract for arms, including an order for 34 MiG-21F-13 interceptors and 4 MiG-21U conversion trainers. Delivered starting in spring 1963, MiG-21s entered service with two squadrons of the 3rd Air Brigade, based at Dmeyr Air Base, 40 km (25 miles) northeast of Damascus. MiG-17s were meanwhile operated by two squadrons of the 7th Air Brigade, based at Almezzeh Air Base, in Damascus. With the ascent to power of the Baath Party, during the 1963 Syrian coup d'état, Hafez Al-Assad (former Meteor- and MiG-17PF-pilot), was appointed the Commander of SyAAF. Preoccupied with his involvement in domestic politics, Assad left the effective command of the SyAAF to his Deputy, Brigadier-General Mohammad Assad Moukiiad (former Meteor-pilot trained in Great Britain). During the Six-Day War, the SyAAF flew few air strikes on targets in northern Israel on the first day of the conflict but was subsequently evacuated to air bases in remote parts of Syria. In this fashion it evaded most of Israeli air strikes that caused massive damage to Egyptian and Jordanian air bases. This, in turn, helped the IDF in defeating the Syrian Army on the ground and led to the occupation of the Golan Heights. After this conflict, Syria continued acquiring small numbers of MiG-17s from East Germany and MiG-21s from the Soviet Union. In May 1973, a new arms deal was signed with the Soviet Union, resulting in deliveries of over 100 additional MiG-21M/MFs by the end of the year. The Yom Kippur War provided initial success for both Syria and Egypt, but the SyAAF suffered extensive losses in air combats, prompting the Soviets to launch an air-bridge to Aleppo and Damascus, starting on 9 October 1973. Replacement aircraft initially included only MiG-17s and MiG-21s: in April 1974, Syria received the first two batches of MiG-23 fighter-bombers. Acquisition of additional aircraft from the USSR was stopped in 1975 due to differences of political nature between Damascus and Moscow. In the late 1970s, an insurgency characterised by dozens of assassinations of government officials and military officers erupted in Syria. By 1978, the Moslem Brotherhood of Syria joined the armed uprising. Concerned by destabilisation of the government of President Hafez al-Assad, Moscow decided to restart providing arms and military aid. In April of the same year, a new arms deal was signed, including deliveries of advanced MiG-23MF and MiG-25 interceptors, and additional MiG-23BN and Su-22 fighter-bombers, and deployment of up to 4000 of Soviet advisors. However, the insurgency continued to spread and included attacks on Soviet advisors. In 1981, the commander of the SyAAF, Major-General Mamdouh Hamdi Abaza, was assassinated by Moslem Brotherhood. In early 1982, hundreds of SyAAF officers became involved in a coup attempt against President Hafez al-Assad, originally planned to take place in coordination with an armed uprising in the city of Hama. The government crushed the uprising in Hama in blood, and subsequently purged the SyAAF. The Syrian Arab Air Force thus entered the 1982 Lebanon War in significantly weakened condition and suffered a massive loss in a series of air combats fought between 6 and 11 June 1982. Israel claimed the destruction of 85 Syrian MiGs (including MiG-21s as well as MiG-23s). No evidence was ever provided for Soviet and Russian claims according to which the SyAAF should have shot down up to 60 Israeli aircraft in return. Nevertheless, unofficial Russian, and few unofficial Syrian sources continue to claim a modicum of success against Israeli aircraft in this conflict. At low altitude the Syrian Air Force effectively used Aerospatiale Gazelle helicopters in anti-armour role against advancing Israeli ground forces. In one such engagement, an Israeli tank column was stopped for some hours by SAF Gazelle missile strikes while approaching Ein Zehalta. Immediately after the 1982 Lebanon War, the USSR continued to refuse deliveries of more advanced aircraft. It was only in August 1982, that Moscow changed its opinion and granted permission for delivery of MiG-23ML interceptors, followed by advanced Su-22M-4 fighter-bombers. In an attempt to help Syria establish a strategic balance with Israel, in 1986 the Syrians were granted permission to place orders for 24 MiG-29s and 24 Su-24s. Deliveries of these commenced in 1987, but were still incomplete by the time the Soviet Union officially ceased providing military aid to Syria, in 1989. Short on spares and lacking funding for fuel and maintenance, the SyAAF was largely grounded for most of the 1990s and 2000s. Reports regarding purchases of Su-27s in 2000-2001, MiG-29SMTs, MiG-31s, and Yak-130s from the period 2006-2008, have all proven to be unfounded. The only reinforcement the air force acquired during this period came in form of 28 MiG-23MLDs and 5 MiG-23UBs acquired from Belarus in 2008. In July 2012 at the Farnborough Air Show it was announced that Russia would not deliver any new aircraft including the MiG-29M/M2s and Yak-130s while there was still a crisis in Syria, but it would still respect any previous refurbishment and maintenance contracts such as the Mi-25s. During the initial phase of the Syrian civil war, up to mid-2012, the Syrian Air Force was involved in secondary roles, with no firing from aircraft and helicopters. The situation changed on 22 March 2012, with an escalation in the use of airpower by Government forces, starting with armed Mi-8 and Mi-17 helicopter gunships firing rockets and machine guns. The air war escalated further in mid June 2012, with the use of Mi-24/25 attack helicopters capable of dropping standard aviation bombs weighing up to 250 kg, while the transport helicopters started dropping barrel bombs, aerial IEDs. On 24 July 2012, attack sorties by fixed-wing aircraft were reported by the rebels and recorded on video: initially L-39 COIN armed trainers began using rockets, bombs and guns but they were quickly joined by MiG-21s and MiG-23s. A few weeks later Su-22 ground attack aircraft were used and in November 2012, Su-24 medium bombers were filmed bombing rebels. In December 2012, conventionally armed Scud missiles and other similar ballistic missiles were fired against rebel positions. Following a report on the appearance of newly delivered S-8 air-to-ground rocket pods previously not operated by the Syrian Air Force, being employed on different aircraft, on 22 October 2013, a S-8 armed MiG-29 was spotted and recorded on video while flying over Damascus, suggesting that the type was pushed into action for ground attack, possibly after the pilots attended specific training on the type. Subsequently, MiG-29's were recorded performing rocket and gun attack runs on rebel positions. The first reported activity of Syrian MiG-25 aircraft in the civil war was recorded on 8 February 2014, when two Turkish Air Force F-16s were scrambled to intercept a Syrian MiG-25 which was approaching the Turkish border. On 27 March 2014, a MiG-25 was clearly filmed while flying at medium altitude over Hama Eastern countryside, possibly delivering the bomb seen hitting the ground in the same video. Until February 2014, Syrian MiG-25s were not seen, perhaps due to the type of war, different from the role of the MiG-25 and possibly due to initial technical difficulties in keeping the MiG-25 fleet operational. The use of the MiG-25 in the Syrian Civil War marks the starting point since when all the known types of Syrian combat aircraft and ballistic missiles came into use. With the start of aerial operations by the Syrian Air Force, in August 2012, online publications probably overestimating rebels' claims on the number of destroyed aircraft, assumed that the Syrian Air Force was suffering significant technical difficulties, resulting in less than half of the best SAAF ground attack aircraft such as the Mi-25 Hind-D being serviceable. The publications reported that an increased number of conflict fronts and severe maintenance burdens dramatically worsened the situation, which was reportedly difficult before the war. These problems were thought to account for the use of L-39ZA (attack variant) jets, before further escalations. Operational limitations were overcome during 2013 as Syrian pilots and technicians with the assistance of foreign advisers and technicians began to improve their operational skills. In December 2013 Jane's reported that the Syrian Air Force had dramatically improved its operational capabilities during 2013, and was now frequently conducting up to 100 sorties per day with half of these constituting combat sorties. Insurgents counter the Syrian Air Force with truck mounted, medium and heavy machine guns, anti-aircraft guns, small arms fire and starting in late 2012, MANPADS up to modern Russian and Chinese designs. As the Syrian Air Force became more involved, the insurgents obtained more anti-aircraft equipment, captured air defense sites and warehouses while receiving shipments of Chinese and Russian material from external sponsors. An improvement in accuracy was achieved and several Syrian Air Force jets and helicopters were shot down from August 2012. Since insurgents besieged many airports, many of the aircraft were shot down taking off or landing. The raiding and shelling of airbases led to aircraft and helicopters being damaged or destroyed on the ground. In spite of occasional losses the Syrian Air Force remained largely unchallenged, efficient and feared by the rebels. Compared to Western air forces fighting against similarly armed enemies in Syria, Iraq and Afghanistan, the main disadvantage of the Syrian Air Force is the lack of precision guided weapons which allow the aircraft to stay out of range of small arms fire, AAA and MANPADS, while bombing accurately. The same weakness prevents them from hitting targets of opportunity in the same mission. In 2014, Jane's Defence and Combat Aircraft Monthly report some MiG-29s and possibly some Su-24s capable of launching precision guided ammunitions. Syrian pilots spend most of their flying time at low to medium altitude where battlefield threats are more potent. Based on the aircraft type, Syrian pilots use different attack techniques for unguided munitions. L-39s attack in a dive, fast jets usually attacked in a low to medium altitude bombing run at high speed, firing thermal decoy flares against IR homing missiles and zooming after the attack. Later, fast jets added rocket and gun diving attacks. Helicopters were seen flying at unusually high altitudes which minimized their accuracy and increased collateral damage, but reduced losses since they did not have the high speed and acceleration of jet fighters; the altitude putting them out of range of most of the ground threats. Mi-24/25 gunships were observed delivering decoy flares as well. The Syrian Air Force frequently attacks insurgent forces with helicopter gunships in populated areas with unguided weaponry and the bombings often cause collateral damage to the civilian population and infrastructure. and warplanes From the end of 2012 until December 2014, Syrian Air Force L-39 were seldom seen, one of the two airbases for L-39 was captured and the other was besieged. In December 2014, videos surfaced showing the aircraft coming back to operational status after a factory overhaul inside Syria. At the beginning of August 2015, a summary of the recent Syrian Air Force activity reported that during July 2015, the Syrian Air Force performed 6,673 air attacks, the highest number since the beginning of the war. It was reported that between October 2014 and July 2015, at least 26,517 attacks were made. This showed that aircraft losses had been overestimated, while the airframe overhauling and rotation increased the overall combat readiness of the Syrian Air Force since Syria could not count on replacements, apart from some refurbished ex-Iraqi Su-22s, delivered from Iran in the Spring of 2015, which had been flown there during the Gulf War in 1991. In early 2015, it was rumored that Russian pilots were flying operations for the Syrian Air Force. No independent source confirmed the claim and no Russian pilots were reported among shot-down crews in the following months. On 18 June 2017, US military officials confirmed that a U.S. F/A-18E Super Hornet shot down a Syrian Sukhoi SU-22 after the warplane dropped bombs near SDF fighters south of Tabqa. Forces of The Islamic State captured Tabqa Air Base on 24 August 2014. The roundel used by the Syrian Arab Air Force has the same basic design as that used by the Egyptian Air Force. It consists of three concentric circles, with a red outer part, white middle and black inner part. The unique part of the Syrian roundel is the presence of two green stars in the white circle, which is reflective of the two stars on the national flag. The fin flash is also an image of the flag. Due to the high security level on everything military related, the past and present of the Syrian Arab Air Force is still largely unknown. This makes it hard to judge the real strength of the air force today. Additionally, considerable losses to the opposition forces in the country's ongoing civil war are not accounted for here. The following information is compiled from multiple, pre 2012 Syrian civil war sources. ^ "bellingcat - The Syrian Arab Air Force, Beware of its Wings". Archived from the original on 28 March 2015. Retrieved 13 February 2015. ^ "Council Implementing Decision 2012/424/CFSP of 23 July 2012 implementing Decision 2011/782/CFSP concerning restrictive measures against Syria". Official Journal of the European Union. 24 July 2012. Archived from the original on 13 May 2013. Retrieved 21 August 2012. ^ Cooper, Tom; Nicolle, David (2009). Arab MiGs, Volume 1. Harpia Publishing. pp. 29–35. ISBN 978-0-9825539-2-3. ^ a b Cooper, Tom; Nicolle, David (2010). Arab MiGs, Volume 2. Harpia Publishing. pp. 19–20. ISBN 978-0-9825539-6-1. ^ Cooper, Tom; Nicolle, David (2009). Arab MiGs, Volume 1. Harpia Publishing. pp. 32–33. ISBN 978-0-9825539-2-3. ^ Nicolle, David; Cooper, Tom; Ali Gabr, Gabr (2017). Wings over Sinai. Helion & Co. pp. 27, 60–62. ISBN 978-1-911096-61-0. ^ Cooper, Tom; Nicolle, David (2010). Arab MiGs, Volume 2. Harpia Publishing. pp. 80–81. ISBN 978-0-9825539-6-1. ^ a b Cooper, Tom; Nicolle, David (2010). Arab MiGs, Volume 2. Harpia Publishing. pp. 139–142. ISBN 978-0-9825539-6-1. ^ Cooper, Tom; Nicolle, David (2010). Arab MiGs, Volume 2. Harpia Publishing. pp. 167–169. ISBN 978-0-9825539-6-1. ^ Cooper, Tom; Nicolle, David (2012). Arab MiGs, Volume 3. Harpia Publishing. pp. 173–193. ISBN 978-0-9825539-9-2. ^ Cooper, Tom; Nicolle, David (2014). Arab MiGs, Volume 5. Harpia Publishing. pp. 55–80. ISBN 978-0-9854554-4-6. ^ Konzelmann, Gerhard (2010). Damaskus. Ullstein Sachbuch. pp. 327–328. ISBN 3-548-35588-9. ^ Krauthammer, Charles (4 August 2006). "Israel's Lost Moment". RealClearPolitics. Archived from the original on 9 October 2012. Retrieved 1 June 2012. ^ "Russia defends arms sales to Syria". UPI. 29 September 2008. Archived from the original on 12 April 2011. Retrieved 24 July 2010. ^ "Russia Blocks MiG-31 Deal With Syria". Middle East Newsline. 21 May 2009. Archived from the original on 22 February 2012. Retrieved 24 July 2010. ^ "First video of a Syrian helicopter gunship attacking rebels near Azaz, northwest of Aleppo". The Aviationist. 22 March 2012. Archived from the original on 23 August 2013. Retrieved 9 August 2013. ^ "Syrian air war escalates: the Mil Mi-24 Hind gunship makes its debut against rebel forces". The Aviationist. 12 June 2012. Archived from the original on 9 August 2013. Retrieved 9 August 2013. ^ "New videos show Syrian gunship helicopters dropping bombs on Homs and Damascus". The Aviationist. 18 July 2012. Archived from the original on 9 August 2013. Retrieved 9 August 2013. ^ "Syria's deadly barrel bombs". Smh.com.au. 2 September 2012. Archived from the original on 11 September 2013. Retrieved 9 August 2013. ^ "Syrian Arab Air Force trainer jets turned into attack planes to strike rebel positions". The Aviationist. 30 July 2012. Archived from the original on 10 August 2013. Retrieved 9 August 2013. ^ "Which figher jets did the Syrian government use to bomb its largest city, Aleppo? — Air Cache". Air.blastmagazine.com. 24 July 2012. Archived from the original on 13 May 2013. Retrieved 9 August 2013. ^ Babak Dehghanpisheh (29 July 2013). "Syrian aircraft bomb Aleppo as rebels fight for city". The Washington Post. Archived from the original on 21 December 2013. Retrieved 9 August 2013. ^ "Assad deploys Syrian Air Force Sukhoi Su-24 Fencer attack planes to hit rebels hard". The Aviationist. 16 November 2012. Archived from the original on 28 August 2013. Retrieved 9 August 2013. ^ Gordon, Michael R.; Schmitt, Eric (12 December 2012). "Assad Fires Scuds at Rebels, U.S. Says, Escalating War in Syria". The New York Times. Archived from the original on 21 April 2017. Retrieved 28 February 2017. ^ Oryx. "Oryx Blog". Archived from the original on 14 February 2015. Retrieved 13 February 2015. ^ "The Aviationist » Syrian Mig-29 Fulcrum jets appear in the skies over Damascus during ground attack missions". The Aviationist. Archived from the original on 26 February 2015. Retrieved 13 February 2015. ^ "Syria Civil War- Fierce Clearly Visible Low Flight MIG 29 Airstrike On Syrian Rebels". YouTube. 21 March 2014. Archived from the original on 12 August 2015. Retrieved 13 February 2015. ^ "لحظة إطلاق طائرة الميغ صاروخا باتجاه المصور - YouTube". YouTube. 27 March 2014. Archived from the original on 18 October 2015. Retrieved 13 February 2015. ^ "Turkish F-16 jets scramble to intercept 2 Syrian Su-24s". Archived from the original on 5 May 2015. Retrieved 13 February 2015. ^ R.S. "Luftwaffe A.S". Archived from the original on 14 February 2015. Retrieved 13 February 2015. ^ "Attrition: The Destruction Of The Syrian Air Force". Archived from the original on 14 February 2015. Retrieved 13 February 2015. ^ Chivers, C.J. (2 August 2012). "Syrian Leader's Weapons Under Strain". New York Times. Archived from the original on 3 August 2012. Retrieved 2 August 2012. ^ "Syrian government using L-39 trainer jets to attack rebels — Air Cache". Air.blastmagazine.com. 9 August 2012. Archived from the original on 13 May 2013. Retrieved 9 August 2013. ^ Location Settings (2 December 2012). "Syrian rebels down aircraft". News24. Archived from the original on 19 June 2013. Retrieved 9 August 2013. ^ "Sudan becomes the newest player in Syria's protracted conflict: NYT - Sudan Tribune: Plural news and views on Sudan". Sudan Tribune. Archived from the original on 16 August 2013. Retrieved 3 September 2013. ^ Kaphle, Anup (13 August 2012). "Syrian fighter jet crashes; rebels claim they shot it down - WorldViews". The Washington Post. Archived from the original on 14 May 2013. Retrieved 9 August 2013. ^ Tom A. Peter. "Syrian rebels struggle to keep regime Air Force on the ground (+video)". CSMonitor.com. Archived from the original on 1 August 2013. Retrieved 9 August 2013. ^ Martin Chulov in Aleppo. "Syrian rebel raids expose secrets of once-feared military | World news". The Guardian. Archived from the original on 8 February 2013. Retrieved 3 September 2013. ^ "Russia helps keep Syria's MiG-29s flying". Archived from the original on 12 June 2014. Retrieved 13 February 2015. ^ Cooper, Tom (October 2014). "A NEW AIR WAR OVER SYRIA". Combat Aircraft magazine. Ian Allan Publishing (10/2014). ^ "Video of Su-22 releasing flares during attack shows Syrian pilots are becoming concerned of surface to air missiles". The Aviationist. 22 October 2012. Archived from the original on 9 August 2013. Retrieved 9 August 2013. ^ "\\خطير\\جبل الزاوية: لحظة انقضاض الطائرة الحربية \الرويحة\ - YouTube". YouTube. 1 February 2014. Archived from the original on 18 October 2015. Retrieved 13 February 2015. ^ "Syria - Su-22 rocket attack from low altitude - amazing". YouTube. 11 May 2013. Archived from the original on 24 July 2014. Retrieved 13 February 2015. ^ "The Aviationist » Syrian Air Force Su-22 leaking fuel after being hit by rebel fire". The Aviationist. Archived from the original on 14 February 2015. Retrieved 13 February 2015. ^ "YouTube". Archived from the original on 10 July 2015. Retrieved 13 February 2015. ^ "Video shows Syrian Mil Mi-25 gunship releasing flares. A sign that rebels got their hands on MANPADS?". The Aviationist. 17 August 2012. Archived from the original on 15 August 2013. Retrieved 9 August 2013. ^ Bloomfield, Adrian; Willis, Amy (12 July 2012). "Syria: helicopter gunships fire on villagers in fresh massacre". The Daily Telegraph. London: Telegraph Media Group. Archived from the original on 4 May 2018. Retrieved 3 April 2018. ^ Linux Beach (30 June 2012). "BREAKING: Syrian Air Force attacks Douma, 10m from Damascus, thousands flee". Daily Kos. Archived from the original on 30 May 2013. Retrieved 9 August 2013. ^ "Syrian forces push into Douma, residents flee". Trust.org. Reuters. 30 June 2012. Archived from the original on 15 April 2013. ^ "Syria\ Shelling Douma by Al-Assad Military Planes". YouTube. 30 June 2012. Archived from the original on 15 May 2013. Retrieved 9 August 2013. ^ "Syrian regime attacks hospital". CNN. 15 August 2012. Archived from the original on 14 August 2012. Retrieved 15 August 2012. ^ "Syrian warplanes hammer rebel border town". Al Jazeera. 15 August 2012. Archived from the original on 16 August 2012. Retrieved 15 August 2012. ^ Oryx. "Oryx Blog". Archived from the original on 17 December 2014. Retrieved 13 February 2015. ^ Cooper, Tom (February 2017). "Syria: Air Power in Decline". Combat Aircraft magazine. Key Publishing (02/2017). ^ "Rebels 'take control of key north Syria airbase'". BBC. 11 January 2013. Archived from the original on 11 January 2013. Retrieved 11 January 2013. ^ Anne Barnard (11 January 2013). "Syrian Rebels Say They Seized Helicopter Base in the North". The New York Times. Archived from the original on 12 January 2013. Retrieved 12 January 2013. ^ Cooper, Tom (2015). Syrian Conflagration. Helion & Co. pp. 46–48. ISBN 978-1-910294-10-9. ^ "BBC News - Syria conflict: Islamic State seizes Tabqa airbase". BBC News. Archived from the original on 27 December 2014. Retrieved 13 February 2015. ^ "Syrian Air Force - Al Quwwat al-Jawwiya al Arabiya as-Souriya". Scramble, Dutch Aviation Society. Archived from the original on 15 May 2011. Retrieved 13 May 2011. ^ "THE ARAB ISRAELI MILITARY BALANCE" (PDF). Center for Strategic and International Studies. 29 June 2010. Archived (PDF) from the original on 15 October 2010. Retrieved 14 January 2014. ^ "INSTABILITY IN SYRIA: Assessing the Risks of Military Intervention" (PDF). Center for Strategic and International Studies. 13 December 2011. Archived (PDF) from the original on 20 November 2013. Retrieved 14 January 2014. ^ a b c d e f g h i j k l m n o p q "World Air Forces 2018". Flightglobal Insight. 2018. Archived from the original on 6 February 2018. Retrieved 4 May 2018. ^ "WAF 1987 pg. 91". flightglobal.com. Archived from the original on 1 July 2018. Retrieved 16 June 2018. ^ "THE WORLD'S AIR FORCES 1955 pg. 658". flightglobal.com. Archived from the original on 1 July 2018. Retrieved 16 June 2018. ^ a b c Cooper, Tom; Nicolle, David (2009). Arab MiGs, Volume 1. Harpia Publishing. p. 29. ISBN 978-0-9825539-2-3. ^ Cooper, Tom; Nicolle, David (2009). Arab MiGs, Volume 1. Harpia Publishing. p. 35. ISBN 978-0-9825539-2-3. ^ a b Cooper, Tom; Nicolle, David (2010). Arab MiGs, Volume 2. Harpia Publishing. pp. 139–140. ISBN 978-0-9825539-6-1. ^ a b c Cooper, Tom; Nicolle, David (2010). Arab MiGs, Volume 2. Harpia Publishing. p. 164. ISBN 978-0-9825539-6-1. ^ Cooper, Tom; Nicolle, David (2010). Arab MiGs, Volume 2. Harpia Publishing. p. 166. ISBN 978-0-9825539-6-1. ^ "Al Moqatel - الحرب الأهلية اللبنانية". Archived from the original on 13 May 2013. Retrieved 10 September 2012. ^ Cooper, Tom; Nicolle, David (2014). Arab MiGs, Volume 5. Harpia Publishing. p. 76. ISBN 978-0-9854554-4-6. ^ a b Batatu, 1999, p. 226. ^ Cooper, Tom; Nicolle, David (2015). Arab MiGs, Volume 6. Harpia Publishing. p. 15. ISBN 978-0-9854554-6-0.
Cooper, Tom; Nicolle, David (2009). Arab MiGs, Volume 1. Harpia Publishing. ISBN 978-0-9825539-2-3.
Cooper, Tom; Nicolle, David (2011). Arab MiGs, Volume 2. Harpia Publishing. ISBN 978-0-9825539-6-1.
Cooper, Tom; Nicolle, David (2012). Arab MiGs, Volume 3. Harpia Publishing. ISBN 978-0-9825539-9-2.
Cooper, Tom; Nicolle, David (2013). Arab MiGs, Volume 4. Harpia Publishing. ISBN 978-0-9854554-1-5.
Cooper, Tom; Nicolle, David (2014). Arab MiGs, Volume 5. Harpia Publishing. ISBN 978-0-9854554-4-6.
Cooper, Tom; Nicolle, David (2015). Arab MiGs, Volume 6. Harpia Publishing. ISBN 978-0-9854554-6-0.
Cooper, Tom (October 2014). "A NEW AIR WAR OVER SYRIA". Combat Aircraft magazine. Ian Allan Publishing (10). Cooper, Tom (2015). Syrian Conflagration: the Civil War, 2011-2013. Helion & Co. ISBN 978-1-910294-10-9.
Cooper, Tom (2018). MiG-23 Flogger in the Middle East: Mikoyan i Gurevich MiG-23 in Service in Algeria, Egypt, Iraq, Libya and Syria, 1973-2008. Helion & Co. ISBN 978-1-912390-32-8.
Cooper, Tom (2018). Moscow's Game of Poker: Russian Military Intervention in Syria, 2015-2017. Helion & Co. ISBN 978-1-912390-37-3. Dijkshoorn, Marco (September 2010). "Syria's Secret Air Arm". Combat Aircraft magazine. Ian Allan Publishing. 11 (9). Cooper, Tom (30 September 2003). "Israeli-Syrian Shadow Boxing". ACIG.org. Retrieved 13 May 2011.